Jeff Skinner scored twice to reach the 40-goal mark for the first time in his career and Buffalo wrapped up the season with a 7-1 victory over the Detroit Red Wings on Saturday. The Sabres finished out of the playoffs and in the draft lottery after starting the season 17-6-2 and ranking first overall on Nov. 27. They finished the season going 3-13-2. “Overall, it was disappointing,” said Buffalo center Jack Eichel, who had two assists. The Sabres second-half collapse has raised questions regarding coach Phil Housley’s future two years into his tenure with an overall record of 58-84-22. Buffalo general manager Jason Botterill backed Housley in February, but that was before the team struggled down the stretch and missed the playoffs for the eighth straight year. Sam Reinhart, Conor Sheary, Zemgus Girgensons and Brandon Montour also scored for Buffalo, which finished the season with 76 points. Rasmus Ristolainen had two assists and Linus Ullmark made 23 saves. Anthony Mantha scored for Detroit, which finished with 74 points. 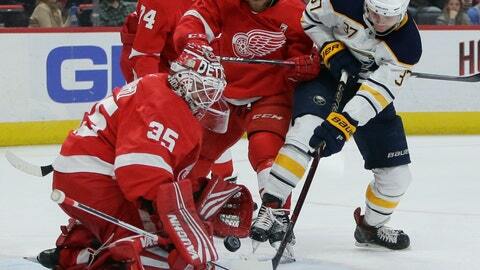 Jimmy Howard stopped shots 21 shots before being pulled in favor of Kaden Fulcher in the second period. Fulcher made nine saves in his NHL debut. Red Wings coach Jeff Blashill signed a two-year contract extension on Tuesday. Despite missing the playoffs for the third straight season, general manager Ken Holland likes the way the Red Wings have competed in most games and the way young players have developed under Blashill. Reinhart opened the scoring 3:22 into the game with his 22nd goal. Dahlin scored his ninth goal, on the power play, with 8:39 left in the opening period. Mantha collected his career-high 25th goal on the power play with 4:49 left in the first. The Sabres scored three goals in the second period to break the game open. Sheary got his 14th goal at 8:37. Skinner his first of the game with 8:31 left in the middle period, and Girgensons scored his fifth goal, just 1:18 later, chasing Howard. Skinner added his second goal of the game, 40th of the season and 200th of his career, and Montour picked up his eighth goal on a power play in the third period. NOTES: Detroit C Dylan Larkin led the team in goals (32), assists (41), points (73) and penalty minutes (75) and became the first Red Wings player to lead in each category in the same season since Johnny Sheppard did it for the Detroit Cougars in 1926-27, the franchise’s first season in the NHL. . Buffalo star C Eichel reached career highs with 28 goals, 54 assists and 82 points. The Sabres and Red Wings failed to qualify for the playoffs.